Beast opens with a beautiful aerial of an English island set to choral music but the serenity of the scene is ended by the conductor telling a young woman that she needs to project more. The abrupt shift of the scene is an excellent metaphor for what is to come in Beast. Moll is at the centre of this story which unfolds in an isolated island town where she plays guide to tourists making a day trip to the area. She's living at home, looking after her ill father and doing her best to fit into her outwardly perfect family but it's clear from the look on Moll's face in the choir rebuke which opens the movie, that not all is well in her carefully manicured life. When her special day is upended, Moll takes off into town and spends the night partying with a stranger which leads her to meeting Pascal, a local outcast with a chequered past who doesn't care what the locals think of him. Moll is immediately smitten but Pascal brings nothing but trouble to her sheltered life and when he becomes the main suspect in a string of grizzly kidnappings and murders, Moll's life is truly upended. Writer/director Michael Pearce's debut feature is an impressively assured work both visually and in terms of storytelling. Pearce dolls out information slowly and with each new tidbit of data, the motivation of the characters shifts, sometimes slightly and other times almost completely. Moll's mother Hilary is clearly overbearing but when we learn the details of Moll's past, Hilary's actions feel a little less severe. The same is true for Pascal who at first seems like a troubled outsider but the more we learn of him, the less guilty he appears. And so Pearce is constantly working in the grey areas where motivations are not fully clear. Jessie Buckley is likely best known for a recent role holding her own opposite Tom Hardy in "Taboo" and here she fully carries the bulk of the movie, taking the audience through Moll's emotional rollercoaster. Johnny Flynn is equally good as Pascal and Geraldine James is downright spiteful as Moll's mother Hilary but the movie is centered on Moll and her experience and Buckley perfectly encompasses the roll which sees her turn from a young woman falling in love for the first time to a woman fully determined to do anything to keep her lover safe before shifting once again into something else. Beast has much going for it including beautiful cinematography and brilliant performances but what I found most engaging is the script and Pearce's unwillingness to give the audience answers. Beast provides information but the movie never passes judgement on the characters and their actions, leaving the audience to determine guilt or innocence. In the days since I saw the movie, I've found myself going back and forth on the ending and wondering whether the actions of the characters were merited. Beast is an impressive debut feature from a filmmaker who clearly revels in challenging storytelling. I can't wait to see what he does next. 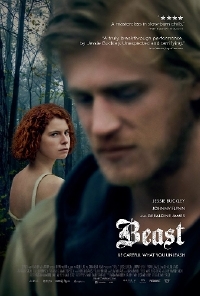 Beast opens in theatres on May 11.